It’s been a lot time since I posted a blog. 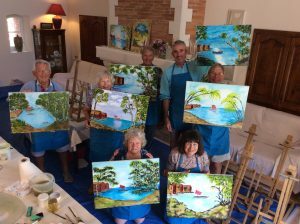 My sincere apologises – it has been wonderfully full this end since the Quarr Exhibition in March and we have just returned from this year’s Residential Painting Trip to France. Oh we did laugh that week and I was invited to stay a further few days to teach additional guests arriving the following week. We all love it there so much, such a beautiful place and the feeling is one of peace and tranquility together with all the delicious food and drink, painting and fun trips out. Sadly, next year will be our final year at this particular location and so if you’d like to make the most of this stunning area and be part of a Residential Painting Holiday in Southern France, please find the itinerary under Residentials on this website and/or contact me directly. Everyone is welcome and it’s my wish to give you a wonderful painting holiday to remember.